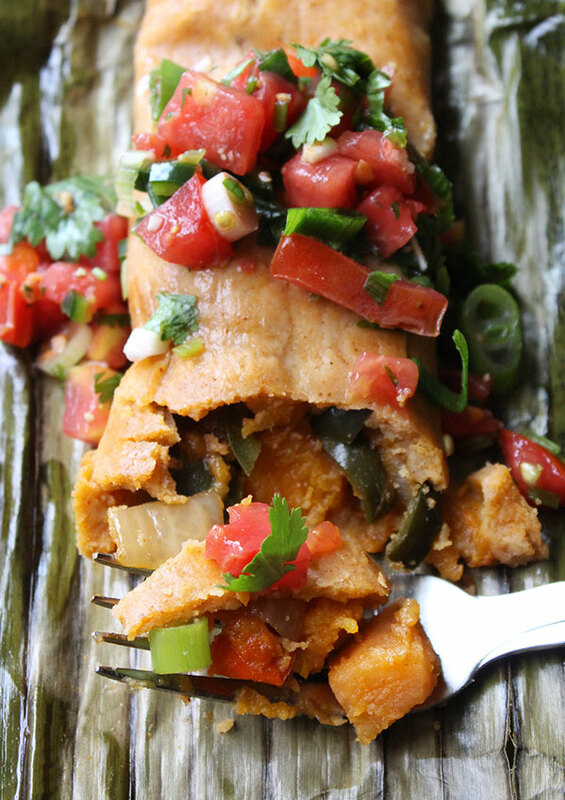 Sweet and spicy vegan tamales topped with salsa fresca and stuffed with sweet potato, butternut squash, bell pepper, spicy poblanos, onion, and garlic. 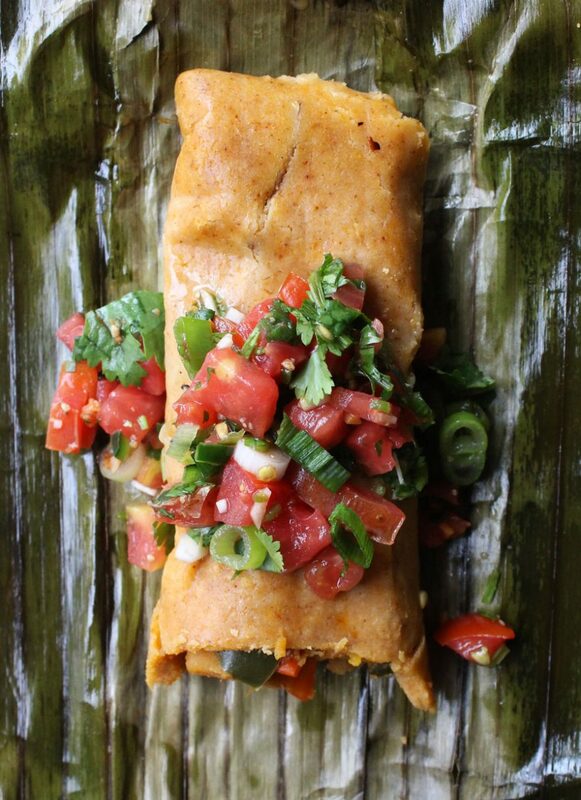 A tamale is basically steamed corn dough stuffed with flavorful filling and all wrapped up in some kind of husk. You cook the filling first, then prepare the dough, assemble the tamales, and steam to cook. There are many different ways to make tamales, but no matter how different our recipes, we can all probably agree on one thing… the best way to make tamales is with friends and family!! That way everyone can pitch in, sharing laughs and good food along the way! Tamales may take time to prepare and cook but they are extremely easy to store and reheat, good for busy days where you don’t have time to prepare lunch or dinner. This time it was just Dominick and I making tamales. We made it a special occasion, a little wine and some good conversation, making enough for friends and upcoming lazy meal days. We separated the tasks, Dominick was on banana leaf prep, I handled the veggie filling, masa dough, and salsa. Then we both went to town assembling the tamales with a few different rolling/wrapping techniques. We figured it doesn’t really matter how you roll it, as long as the dough is covered completely. I learned something new this time around. When I lived in Kansas City, Mexican markets were all around, and corn husks were easy to find. Now I live near more Latino markets where no corn husks were to be found, only banana leaves. Thankfully my good friend had told me about her weekend filled with family and tamale making, using banana leaves! I had never used banana leaves until now, but they do indeed work just as well, if not better than corn husks. Banana leaves normally come frozen, and need to be thawed, rinsed and slightly dried. Dominick and I were very surprised when he took them out of the package, they were huge, it looked like he was unfolding a tent! We laughed about how if we ever got stuck on an island, we know now to build shelter using banana leaves. The filling is always adaptable, it can include any vegetable, meat, and flavoring you desire. We really enjoyed the sweetness of the butternut squash and sweet potato paired with the heat of the poblano, chili, chipotle, and paprika. Sometimes we’ll add in beans, or corn too for even more heartiness. Some people bake/roast their veggies, I prefer to simmer them in a pot with a little bit of water and a lid, that way I can use the flavorful broth that’s leftover in the dough. It’s this incredible golden sauce that adds the perfect flavor to the dough. It beats canned or boxed store-bought broth by a long shot! The excess golden vegetable broth from the filling should be just enough liquid to make a dough that isn’t too wet or too dry. Water can also be used if you need more liquid or in place of the golden broth completely. If the dough is too dry, when you cook it, it will turn out too dry. If the dough is too wet, the dough may not set and can remain wet and mushy. The dough before it is cooked will be, for lack of a better word, pasty. Although some people make their dough as wet as porridge, my dough was like super soft play dough, anywhere in-between will work. You can always try adding a little bit more water or broth to your dough as you go, to see which texture you like best. The dough can be as plain or flavorful as you like, some people just like a plain dough, maybe with a little lime, salt and pepper, or maybe you prefer a spicy dough with lots of spices. 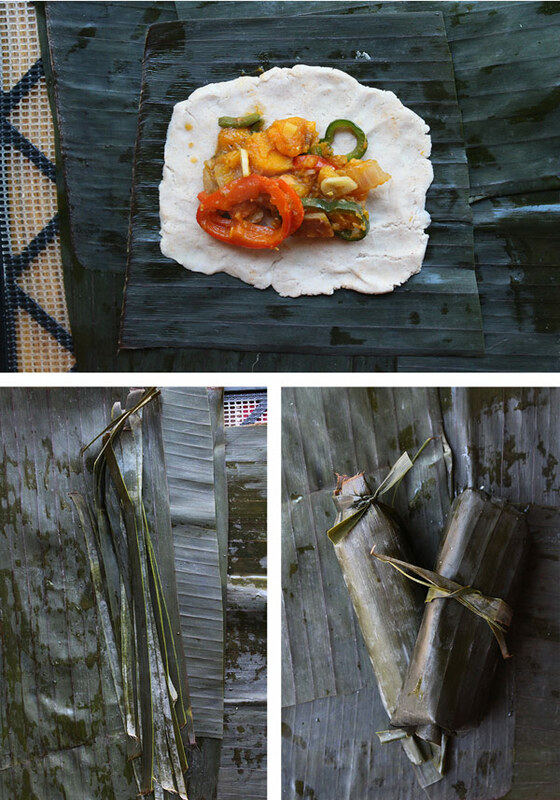 As I mentioned before you can use banana leaves or corn husks, they both are used to wrap the dough entirely. 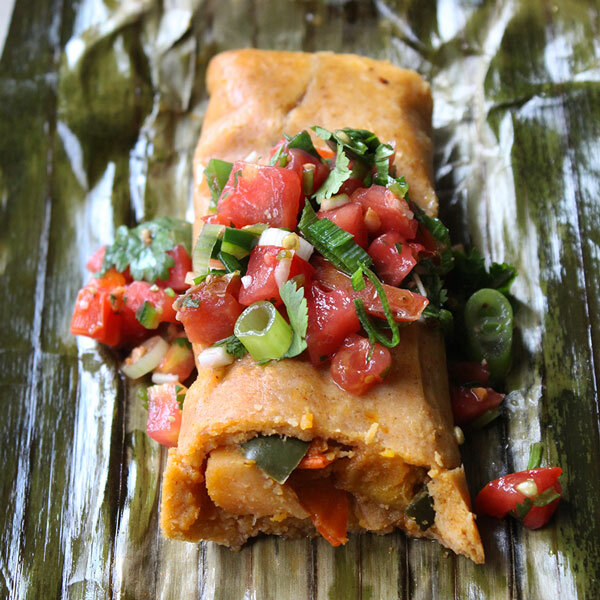 Each of them can easily be torn into long thin strips to wrap and tie up your finished tamale. The corn husks have to be soaked until pliable, they come in a triangle shape, and you can roll them like a tootsie roll or fold in the sides like a gift and tie up the middle. The banana leaves have to be cut down into rectangles, or squares.. As long as all the dough is covered, it doesn’t really matter how you roll or wrap it. We don’t have a fancy pressure cooker or steamer, we just used a good old pot with a lid and a metal strainer. We put the tamales in the strainer, on top of the pot of boiling water, and let them steam for about 45 minutes covered with a lid. Make sure your check the water level periodically, you don’t want to run out of water and burn your pan up. To reheat, you can re-steam them for 5-10 minutes or you can bake them in their cocoon so they stay moist, for about 10-15 minutes. If you bake them without the banana leaf of corn husk, the dough will dry out. Salsa fresca is a simple delicious addition, this time I diced everything up by hand, tomatoes, scallions, garlic, cilantro, lemon, lime, sea salt and pepper. Perfection. Soft moist masa dough filled with flavorful veggies and spices. Let banana leaves thaw, then rinse, drain and cut into 8"x4" rectangles. Tear a section of banana leaves into strips along the plant's vein, these will be used to tie up the tamale. Peel the butternut squash. 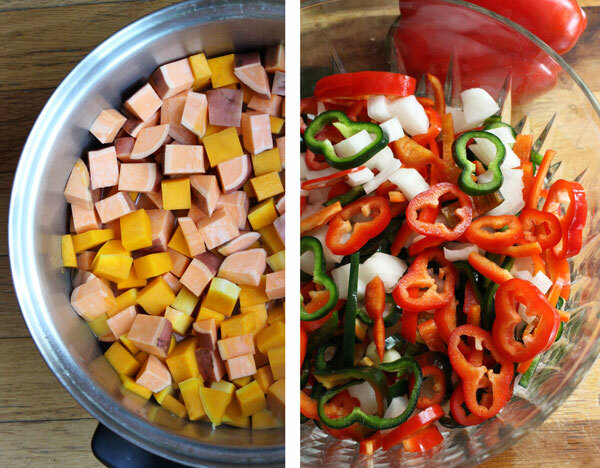 Cut the butternut squash and sweet potato into cubes. 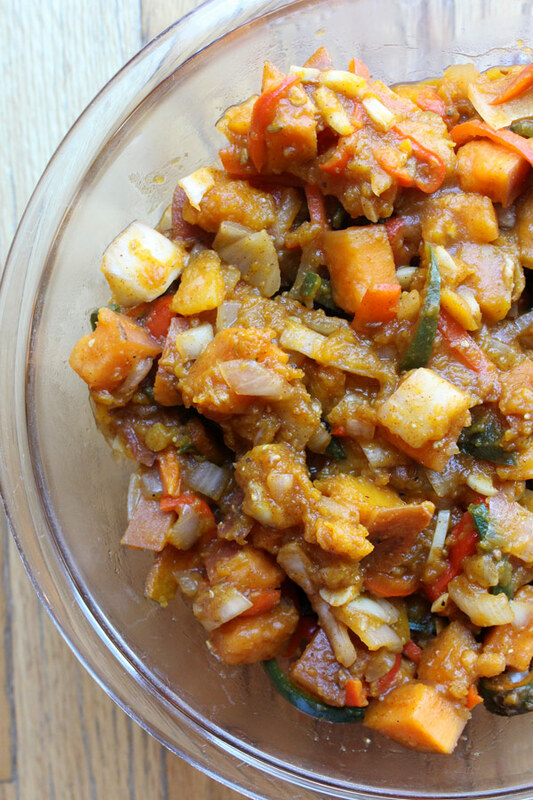 Add the sweet potatoes, butternut squash, and water to a pot and simmer on low until they begin to soften, about 10-15 minutes. Add in the rest of the filling ingredients and then simmer for another 10 minutes or until all the veggies have softened. Add all of the dough ingredients to a bowl and mix together. Mash out a spoonful of dough onto the banana leaf, make sure there is space to fold in the ends and enough dough to meet edges when rolled around the filling. Add a strip of filling to the middle of the dough. Roll up the tamale and make sure the ends of the dough meet. Tie up the ends like a tootsie roll, or fold in the ends like wrapping a gift and tie up the middle. Boil about a quart of water in a pot, use a steam basket or a metal strainer to hold 5-8 tamales at a time, and cover with a lid. Steam each batch for about 45 minutes or until the dough has set and doesn't feel mushy when poked, it should bounce back. Serve hot and top with salsa. Craving these, my friend! They look amazing!